3rd January - Magic Mountain, Valencia. 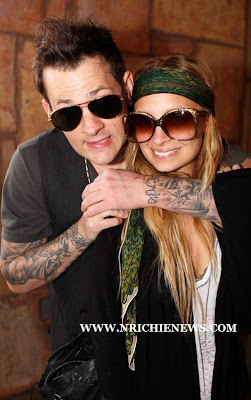 Nicole Richie, Joel Madden and friends posed for pictures yesterday afternoon whilst enjoying a day out at Magic Mountain fair, in Valencia - California. The occasion was to celebrate New Year with the children from the Beyond Shelter. Nicole Richie, Joel Madden and their children's foundation are working with the children at Beyond Shelter to improve their future and quality of life. They all looked like they had a great time at Magic Mountain! Nicole Richie's fashion choice's for the day at the fair was spot on. Nicole Richie wore her classic signature Keith Richards-esque look - a green scarf worn as a headband. Dark skinny jeans teamed with a long black cardigan. I think the best store to find a Nicole Richie style cardigan or jumper is All Saints. Nicole Richie brought a staple piece from her 2008 autumn wear a fluxus deep V Burnout 'tee. I am loving Nicole Richie's moccasin boots with gold hardware. They are a great choice for this winter weather. For cheaper version's of Minnetonka inspired booties and flats i recommend Urban Outfitters. To complete the outfit Nicole Richie carried her Balenciaga city bag.